This is an atlas of maps and graphic representations of the geographies of the new electronic territories of the Internet, the World-Wide Web and other emerging Cyberspaces. These maps of Cyberspaces - cybermaps - help us visualise and comprehend the new digital landscapes beyond our computer screen, in the wires of the global communications networks and vast online information resources. The cybermaps, like maps of the real-world, help us navigate the new information landscapes, as well being objects of aesthetic interest. They have been created by 'cyber-explorers' of many different disciplines, and from all corners of the world. Some of the maps you will see in the Atlas of Cyberspaces will appear familiar, using the cartographic conventions of real-world maps, however, many of the maps are much more abstract representations of electronic spaces, using new metrics and grids. The atlas comprises separate pages, covering different types of cybermaps. 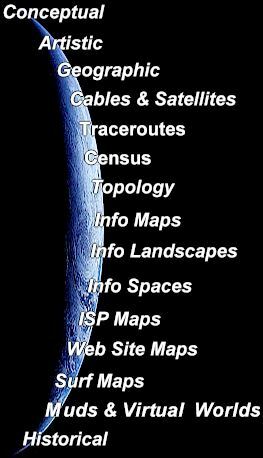 For more information on the geographies of the Internet, the Web and Cyberspaces, check out The Geography of Cyberspace Directory. If you're interested in discussing the wider issues why not join the Mapping-Cyberspace list? Maintained by Martin Dodge (m.dodge (at) manchester.ac.uk), Cyber-Geography Research, Geography, University of Manchester.